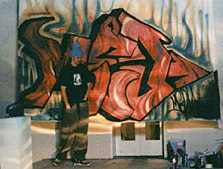 Brian Vander Ark is "Tagger", a white graffiti artist, hired to perform at Paternell's benefit party for Joshua. Brian,made his feature film debut as "Joey" in Leutwyler's filmRoad Kill. He is the lead singer for the band "The Verve Pipe". He's currently in the studio recording the follow up to his band's platinum selling album.